For my last post, I made about a gazillion Spring Rolls. There were so many, I was practically swimming in them! Not that I’m complaining – I could….and (embarrassed to admit) would, eat nearly every last one. Like a sad girl sitting on the couch, watching bad soap operas, and eating bonbons, I ate these things like I had no regard for my waistline. I needed to break out of the mindless noshing on layers of crispy wrappers surrounding porky goodness. 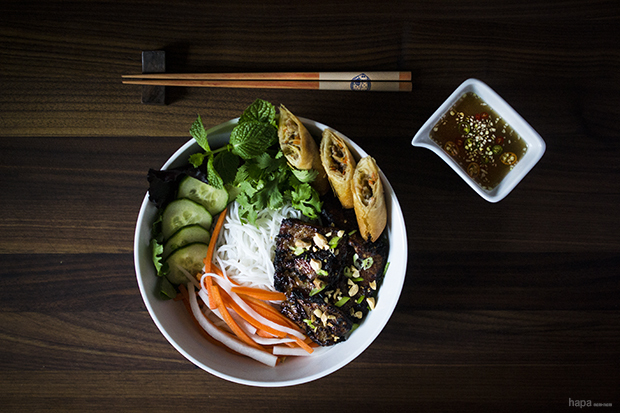 I knew exactly what to make – a popular Vietnamese dish called, Bun Thit Nuong Cha Gio. 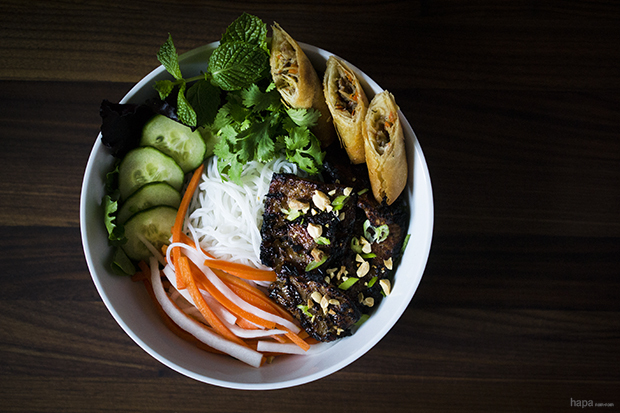 Bun thit nuong literally means ‘grilled meat on noodles’ – a bowl of rice vermicelli, topped with delicious grilled pork, fresh herbs, vegetables, and dressed with nuoc cham (a dipping sauce). When spring rolls (cha gio) are added to the dish, it becomes Bun Thit Nuong Cha Gio (Grilled Pork and Spring Rolls with Noodles). Aka – a bowl full of yum! If you don’t have a surplus of spring rolls on hand, like you’re preparing for the apocalypse, feel free to make this dish sans spring rolls. While the rolls add a wonderful crispy element, the dish still hits on all of the flavor profiles giving you a full and satisfying taste experience. Pound the pork loin chops to ⅛ inch thickness, slice in half vertically and horizontally, set aside. To make the marinade – add the muddled scallions, garlic, sugar, fish sauce, soy sauce, molasses, sesame oil, and black pepper to a mixing bowl. Stir to combine. Transfer the marinade to a zip-top bag and add the pork. Seal the bag and turn to coat. Refrigerate and allow to marinate for 2 hours to overnight. Preheat the grill to high heat. Place the marinated pork in a ‘meat cage’ – coated with non-stick spray. This can be found in most Asian grocery stores. If you can’t locate one, you may thread the meat on a bamboo skewer soaked in water for 15 minutes. Place the meat directly over the flames and cook for approximately 3 minutes, turning frequently until the pork is cooked through with a bit of char. If you would like to use the oven instead, place the pork on a baking sheet and cook under the broiler for 2-3 minutes per side. Divided the mixed greens evenly among 4 bowls. Add the rice vermicelli noodles, cucumber slices, mint, cilantro, and do chua. Then add the grilled pork and top with the dry roasted peanuts. Slice the spring rolls in half and add two per bowl. 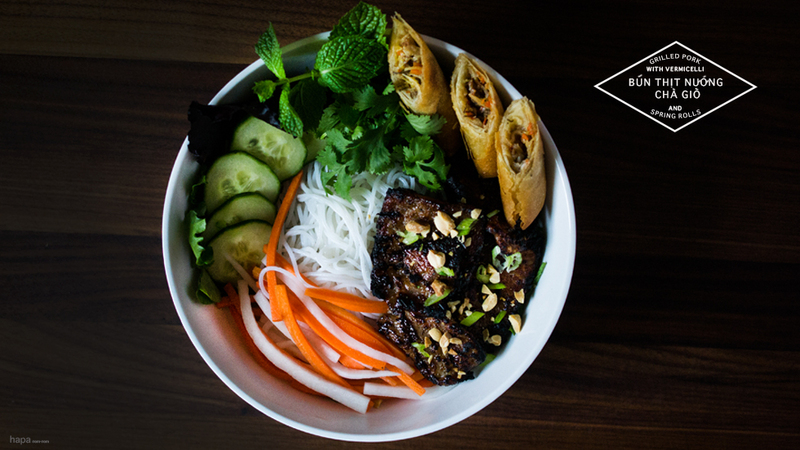 Dress the entire dish with the nuoc cham, serve, and enjoy! How do you make the sauce for this dish? Hi there! Thanks so much for stopping by! There’s a link for the Nuoc Cham sauce in the recipe. I’ll leave a direct link here for you 🙂 Hope you enjoy! I just had a vegetarian sort of variation on this and your photos have me craving the porkified version! Thanks, Bryan! I think everyone should have a surplus of cha bio on hand 🙂 Did your vegetarian bowl have tofu? I would think with the right preparation, that could be mighty tasty as well!? Vietnamese noodle bowls!! OMG I love these sooo much. My marinade is slightly different cause I use lemongrass in it instead of scallions but the overall flavour would be similar. Oh and mine aren’t as fancy as yours cause I don’t usually have spring rolls on mine. I am seriously impressed with your bowl of goodness!